I thought the Swift Boats Vets for Truth had pretty much cleared this up.... I mean, isn't this like everyone in the company knowing your resume is fake? 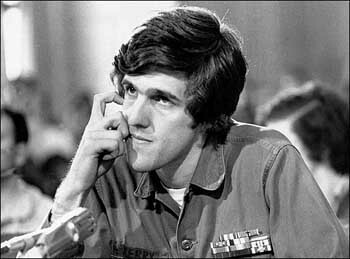 John Kerry entered public life because of a burning desire to help people. Having seen bad decisions made in Washington that put too many people at risk in combat, he was determined to do better. Coming back from the Vietnam War, where he served two tours of duty and was highly decorated for bravery, he felt a responsibility to help his buddies still in Vietnam and all of the other servicemen there by working to bring about a change in policy in what was a war gone wrong.